The European Space Agency's Philae comet lander, which dropped onto Comet 67P/Churyumov-Gerasimenko from the Rosetta spacecraft last November, beamed an 85-second wake-up message to Earth via Rosetta yesterday (June 13), ESA officials announced today. It was the first signal from Philae in seven months since the probe fell silent on Nov. 15 after its historic comet landing. According to Ulamec, Philae is currently experience temperatures of minus 31 degrees Fahrenheit (minus 35 degrees Celsius) and has about 24 watts of power available. 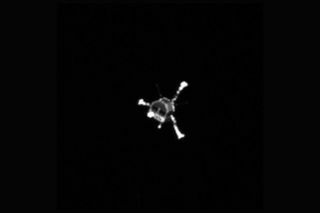 During its wake-up call to Earth, Philae beamed 300 data packets home and was most likely active before the first signal reached Earth on Saturday, ESA officials said. "We have also received historical data – so far, however, the lander had not been able to contact us earlier," Ulamec said in the same statement. These images from the European Space Agency's Rosetta spacecraft show the approach of the Philae comet lander (insets) to Comet 67P/Churyumov–Gerasimenko on Nov. 12, 2015, including views of the probe's bounces on the surface. Philae is a solar-powered probe about the size of a washing machine that landed on Comet 67P on Nov. 12, 2014. It dropped to the surface from its mothership Rosetta, but bounced twice when its anchor-like harpoon system failed to secure it to the surface. The probe ultimately ended up in the shadow of a cliff face on the comet. After about 60 hours the probe's batteries ran out and it went into hibernation on Nov. 15. Over the last seven months, Rosetta and Philae mission scientists in Europe have hoped that once Comet 67P approached closer to the sun, Philae might receive enough sunlight to wake itself up from its forced slumber. Those hopes, it seems, have finally been realized. This European Space Agency image of Comet 67P/Churyumov–Gerasimenko show the five most likely candidates for the final landing spot of the Philae lander after it separated from the Rosetta spacecraft on Nov. 12, 2015. The top left candidate may be the most likely site for Philae. ESA officials said Philae has more details about Comet 67P to share with scientists on Earth. "Now the scientists are waiting for the next contact," ESA officials wrote in a statement. "There are still more than 8,000 data packets in Philae’s mass memory which will give the DLR team information on what happened to the lander in the past few days on Comet 67P/Churyumov-Gerasimenko." The Rosetta comet mission launched toward Comet 67P in 2004 and traveled 4 billion miles (6.4 billion kilometers) over 10 years to reach its destination. Rosetta arrived at the comet in August 2014 and is expected to continue studying 67P through December.